Mark Hamill, Carrie Fisher, Adam Driver, Daisy Ridley, John Boyega and Oscar Isaac return for the Rian Johnson-directed second film in the ‘Star Wars’ sequel trilogy. Star Wars has now occupied a galaxy of its own in the zeitgeist for 40 years and shows no signs of disappearing anytime soon; to the contrary, each New Year brings a new Star Wars film of one kind or another, so using the word “last” in connection with anything to do with the series seems a bit disingenuous. Rather, this latest, and longest, franchise entry has the decided feel of a passing-of-the-torch from one set of characters, and actors, to the next. Loaded with action and satisfying in the ways its loyal audience wants it to be, writer-director Rian Johnson’s plunge into George Lucas’ universe is generally pleasing even as it sometimes strains to find useful and/or interesting things for some of its characters to do. 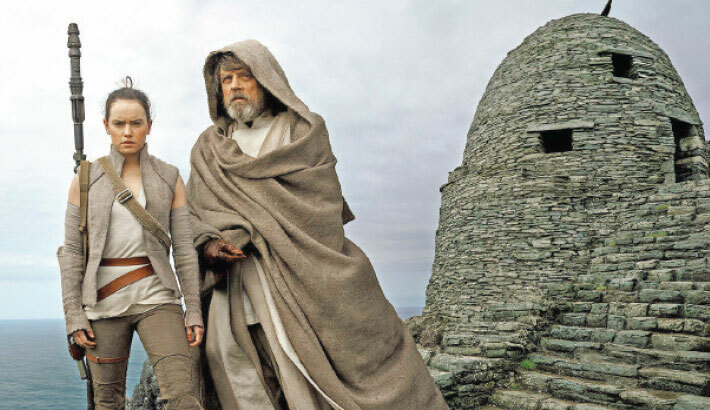 As indicated by the dramatic finale of ‘Star Wars: The Force Awakens’ two Christmases ago, the follow-up is anchored by the attempt by Daisy Ridley’s Rey to persuade Mark Hamill’s Luke Skywalker to indoctrinate her in the ways of the Jedi. As to the first issue, neither here nor in ‘The Force Awakens’ is it convincingly shown how the demolished Evil Empire was able to bounce back so powerfully just 30 years after its destruction. Even less clear is where Snoke came from, not to mention how he ended up with a face that looks like a twisted and rotted old tree. It feels like not nearly as much time is spent with the bad guys than has been the case in previous Star Wars incarnations. As bold soldier Finn, John Boyega made a big splash two years ago, but his character more or less treads water here; he’s reduced to more generic athletics. An adventure he shares with a new character, maintenance worker Rose Tico (Kelly Marie Tran), isn’t one of the most compelling interludes of the film’s 162 minutes. The one character who begins to come into his own here is Oscar Isaac’s fighter pilot Poe Dameron. His status seemed rather generic and uncertain in The Force Awakens, but there’s more confidence here both in the writing and performance of the character as he steps up to fill the void left by Harrison Ford’s Han Solo, without yet having achieved that sort of stature. Laura Dern’s Vice Admiral Amilyn Holdo is a lavender-haired, oddly accoutered contemporary of Leia who turns up ostensibly to help the Resistance. But she has an odd way of speaking, doesn’t like “trigger-happy fly-boy” Poe at all and is so negative about every proposal made to thwart the enemy that one might imagine she’s working for the other team. Time will no doubt tell what her game is, but one shares Poe’s apprehensions. Mixed in with these emotions is the poignance attached to Fisher’s death a year ago toward the end of production. Johnson has a tendency to create digressions within digressions, not that there’s anything necessarily wrong with that as long as you’re skilled enough to keep multiple balls in the air, which he mostly is. The humor does at times strike notes unusual for the franchise, more often to the good than bad, and John Williams’ vigorous eighth Star Wars franchise score never sounds rote or tiresomely familiar. Maybe the film is a tad too long. Most of the new characters could use more heft, purpose and edge to their personalities, and they have a tendency to turn up hither; drawing a geographical map of their movements would create an impenetrable network of lines. But there’s a pervasive freshness and enthusiasm to Johnson’s approach that keeps the pic, and with it the franchise, alive, and that is no doubt what matters most.